We’re all looking for relationships that go beyond the surface and delve into the heart—we want to be known and know others. However, often we hide who we truly are, in fear and shame, concerned that our lives aren’t as picture perfect as our friend’s social media story. In Real, Catherine Parks writes with warmth and insight, inviting us out of the shadows of our sin and into the mercy of Jesus. I'll tell anyone anything, as long as I'm not face to face with them. Being real is easy when I don't have to look a person in the eyes while I confess my sin or address their sin, confess my fears or speak lovingly to their fears, and I fear I'm not alone in this. 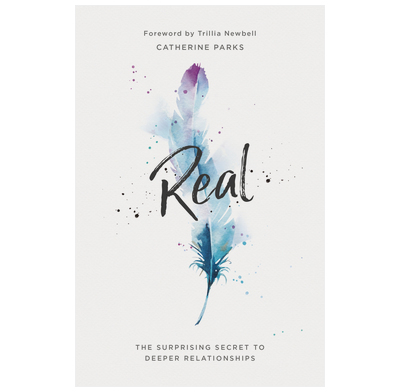 Catherine Parks gets real with her readers about her own reticence to being real, helping us to see our real problem is with God. In a world filled with social media highlight reels, image-conscious personal "brands," and surface-level friendships, we need fresh invitations to consider something more honest and life-giving. As it stands, most of us have multiple "selves" that we put on display—almost like actors on a stage—depending upon the setting in which we find ourselves. We have a work self, a family self, a social gathering self, a church self, and so many other selves, all designed to control what other people think about us. Meanwhile, the gospel is right there, gently reminding us that we are already approved of in Jesus, and quietly beckoning us to stop our posing and instead offer others the gift of knowing us more truly and fully. In Real, Catherine has done a wonderful job leading us in this direction, and in so doing toward a more genuine experience of God and community. I highly recommend this book.